How did an ancient Roman building appear in Miami? 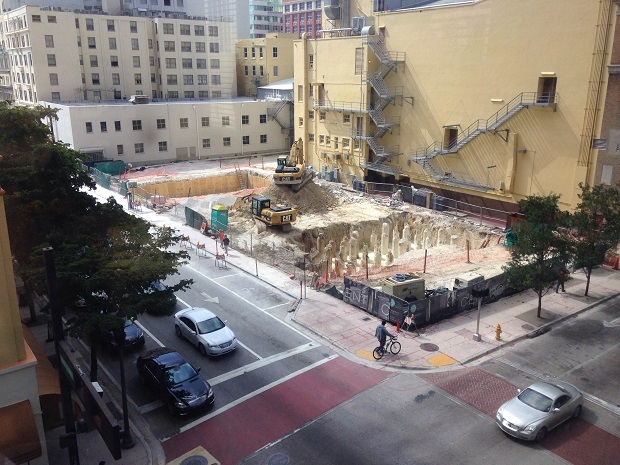 Miami, FL – An ancient structure was just discovered behind the Olympia Theater in Downtown Miami, and it appears to have many classical Roman characteristics. While the news is mind-boggling enough that the stone building was unearthed in the heart of urban Miami, what is harder to believe is the fact that the Vikings might not have been the first Europeans to discover the Americas. This find will change everything we know about modern history if it can be dated and identified to truly be Roman. The ruins were uncovered after a construction crew began digging the foundation for a new condo tower in the heart of Downtown Miami behind the historic Olympia Theater. After the construction crew began digging, they discovered a few strangely arranged coral stone rocks. The foreman noticed that the flat circular stones appeared to be the tops of man-made columns, set into rows and in an orderly pattern. The city of Miami then quickly halted construction. This news comes in just after an ancient Tequesta Native American village was discovered half a mile away at the mouth of the Miami River which appears, from preliminary dating, to be around the same age as the newly discovered ruins behind the Olympia Theater. Historians, Archeologists and Scholars the world over are currently pouring into Miami to aid in the identification effort in which at current, is fully underway. Some additional artifacts have also been discovered including bronze hand tools that after preliminary field testing, seem to contain traces of the same iron found in the hills outside of Rome. A historian from the National Archaeological Museum of Perugia in Italy informed our team that there are documented stories that after Western Rome collapsed at the end of the 5th century AD that many people fled the Italian peninsula. Eastern Rome was established in Constantinople (modern day Istanbul, Turkey), but many people sailed westward including a large flotilla of ships that was apparently lost at sea after a large storm. If the structure is in fact roman, could the Tequestas and lost Romans have co-existed, maybe even intermarried? Did the Romans stay in America? There are many questions that still need to be investigated, but the news is truly ground breaking. Check back in to OurCrave.com for future developments. 23 Responses to Ancient Roman Temple Discovered in Miami! The Phoenicians were supposedly in New Hampshire & New Mexico, but I’ve never heard if the Romans making it here. No, the vikings were not first, and poor old Christopher Columbus damn sure wasn’t. When I got to class at Jackson next Friday 6/20/14 I’m going to have to go check this out. Until I see a closer image I can’t discern whether the columns are carved from limestone (very soft and porous; easy to shape with rudimentary tools) or, in fact, carved from Rome’s choice of marble and other denser stone materials. Sooooo… Roman? Probably not. Taking advantage of the local geology to create more solid structures: more likely. Just a gentle reminder….native indigenous civilizations have been here in the americas for eons. one can say “that vikings romans spaniards etc crossed the atlantic for the first time and arrived in the americas around such and such a time….”….but “discovered” implies nothing was there prior and that’s incorrect. love and wisdom. Frank Allegro, thank you for your gentle reminder. You are a true gentleman! To discover something doesn’t imply that there was nothing prior. There was a time where humanity discovered the laws of physics, or the existence of dark matter. These forces existed for billions of years, but we “discovered” them in the sense that we learned about their existence for the first time. In that sense, the Americas were discovered. The Old World Europeans did not know it existed, and then they did. That’s a discovery. Everyone knows the natives were here first, and the genocide that happened next is one of the worst atrocities in human history. We don’t need a comment about the semantics of the word “Discovery” every time someone brings up a discussion about the colonization of the Americas. It’s getting tedious. The rebar is clearly of the type used in Atlantis. There is local limestone, especially around the ridge, the is very dense and would hold up to the elements. Think of the boulders on the ridge along Bayshore Drive in the Grove. As far as the intermarriage theory, they do have those remains of the Tequesta graveyard that they dug up and moved over near the Flagler Circles. Those remains could be DNA tested and compared to Romans from the same time period. AMERICA WAS CREATED BY JESUS…. ALONG WITH THE REST OF THE WORLD. It’s a proven fact that the Tequesta adopted a policy of ‘wet sandal, dry sandal’ toward the Romans that eventually led to a flood of Italian refugees. Today you can see proof of this by the number of pizza parlors and Italian restaurants in South Florida, all run by the descendants of the Italian rafters. As we know from later European contact with Native Americans, the population of the natives quickly collapsed after contact. Native Americans just did not have an immune system to fend off all of the diseases that the Europeans brought with them to the Americas. I find it extremely unlikely that the Romans and Tequestas coexisted. For that to have happened, the Tequestas had to have had a great immune system when they met the Romans, or the Romans were in perfect health with no diseases. This would also mean that somehow, in later years, the Tequestas immune system got weaker when they met later Europeans. Perhaps they were elderly Jewish Romans? Perhaps it is what is left over from the Wendy’s and Office building that used to be on that site! Perhaps it is part of the Royal Palm Hotel built in the early 1920’s. Apparently, Hialeah is the new old downtown Miami. I wouldn’t be surprised if the Egyptians/Romans sailed to USA, they’ve found tobacco & cocaine in Pharaoh’ mummified remains, they MUST have got it from South America, no other country now or then has it growing. So one civilisation or other traveled to other continent. They’ve been saying for all my life and much longer that Sumer was 1st civilisation, without really checking thoroughly. Then when evidence is FOUND to warrant further study, they suppress/hide the finds and even order the whole areas closed, and stop any excavations. They do the same in the UK. Gobleki Tepe! They find 12,000-15,000 yr old temples, built over 1,000s of years, the carvings are superb quality, the figures are dressed in silk/cloth robes and belts, showing complicated society, looms, animal/plant fibre weaving. YET the authorities say the Hunters in Furs built this temple and made fantasy figures dressed in great clothes, but the people carving the figures use stone axes/antler tools and dress in animal skins as have no society/weaving to make cloth. LIES, LIES and more LIES! They were a highly advanced society, moving/carving large mutli-ton stones from far away, as all other ancient societies found so easy to do. With alignment of temples to lunar/solar/stellar points, so WHY should we believe you lot again, that they are primitive people with little organisation, it just doesn’t fit. Wow. I am amazed. You really never thought that maybe these are the footings for the hotel that was just demolished at that site? You see columns and immediately jump to the conclusion that it had to be the Romans, even though The columns have no roman characteristics, and also that the “ruins” fit exactly into the footprint of the Urmey hotel, which stood in exactly this spot? You people cannot really be serious.